It has come to our attention that many people wonder about the difference between a shaman and a Mide (member of the Anishinaabe Midewiwin Lodge who is a healer, a philosopher, an artist, or all three of them combined). First of all, SHAMAN, a term originally used for Native healers in Siberia, has become a NEW AGE-inspired catch-all term that is foreign to, and way too general to be applied to, any type of spiritual practitioner (or artist) belonging to the original inhabitants of Turtle Island (America). Even Miskwaabik Animikii, who was undeniably the greatest Native/Aboriginal artist of the last century but at one time became influenced by outsiders coersing him into their New Age worldview, helped spreading the term "shaman." But what is it, then, that distinguishes Shamanism from Native American spiritual/traditional Life Ways? Let's take a close look at the Midewiwin, or the Lodge Of Healers Who Are In A Sacred And Unseen State, an ancient Medicinal society that for thousands of years has shaped Anishinaabe society and whose rites until today promote bimaadiziwin: leading a long, healthy and upright life, spiritually, socially, and politically, both individually and collectively. Two methods of treating the sick are in use among the Midewiwin; both methods depend on communication with, and the aid of, the spirit world, but most Mide specialists are basically plant doctors, herbalists who have an encyclopedic knowledge of the mysterious properties of an enormous variety of plants, herbs, roots, and berries. This herbal knowledge is often obtained from dreams, the remedies and knowledge and know-how being handed down from the spirit world ALWAYS individual, and NEVER general. Inaabandamowinan (dreaming) or seeking waasayaa-bindamiwin (a vision) are the primary means by which a healer (or an artist!) can enter into direct social interaction with the spirit world. Today’s Mide healers, as well as some artists (particularly Medicine Painters) who are also a member of Midewiwin, still attribute healing powers to makwa the bear, nigig the otter (who once saved the People from extinction by bringing from the depths of the waters a healing plant), and makadeshigan the black bass (who is said to have once offered himself as a medicine)... Some of the best Mide remedies are received from the bear through dreams. It is important, though, to understand that a Mide healer and/or artist can only reach the highest possible order of healing powers through a HIGH ETHICAL STANDARD, and not by KNOWLEDGE OR SKILLS ALONE. What counts are not only knowledge of, for instance, plant and self, but also the ability to bring together the healing capacities of both plant (or artwork) and self. Only a herbalist gifted with and keeping up a high standard of inner power can expect the plant being to reveal his own healing power; only then the plant will allow the herbalist to confer his (or her) inner curative power upon the plant itself. The same principle applies to artists: in order to find answers, an artist must reach inside and at the same time look at, and focus on, and communicate with, the animals, the plants, the fish, the spirits, and the ancestors. Then there is another type of Anishinaabe Mide doctor, called JAASAKIIDJIG (seers using the Shaking Tent), a special category of healers belonging to the highest degree of Midewiwin practitioners, who treat the sick without material means, without using herbs and medicinal plants, but via ecstatic trance-journey. Some jaasakidijig receive their power from the water, others from the wind or earth. A jaasakiid has the power to make a tent and everything that’s in it shake by inviting a myriad of beings from various spirit worlds, including the bear and the turtle. It is with the aid of these spirits from the waters, the winds, and the earth that jaasakiidjig pass on their spiritual medicine power to their patients or apprentices. Perhaps this practice of the Shaking Tent comes closest to the definition of a SHAMAN: a specialist who with the aid of rhythmic drumming and chanting enters a very deep or "ecstatic" trance, undertaking trance-journeys for practical purposes, in service to his or her community. The point is, however, that unfortunately nowadays the terms "medicine man" and "shaman" are being used interchangeably to describe Native healers and philosophers, and sometimes artists who work in the discipline of the Native Woodland Art School. Nowadays it is widely assumed that "shaman" is a Native American, or Inuit word, and that "shamanism" is a universal Native "Religion." But people should understand that there are MANY HUNDREDS of Native American Nations on Turtle Island, each with their own culture, language, and spiritual belief system (of which Midewiwin is just one). Many of these Nations are very different from one another in their spiritual traditions, and NONE of them describe their beliefs, or rather ceremomial practices, as SHAMANISM. Art gallery owners, plastic medicine men and self-appointed gurus and "Grand Shaman Artists" with a Native background, the entertainment industries, teachers, written publications, and a tsunami of misinformed New Age-inspired web pages ("shamanic portals") promote these misconceptions; it’s high time they are corrected. It’s high time this fraudulent version of Native American belief systems is brought to a halt. So please, let’s honor our ancestors and give them back their dignity and their diverse and unique healing powers by acknowledging the original context in which they lived and worked. Miigwech gibizindaw noongom; thank you for listening to me today. 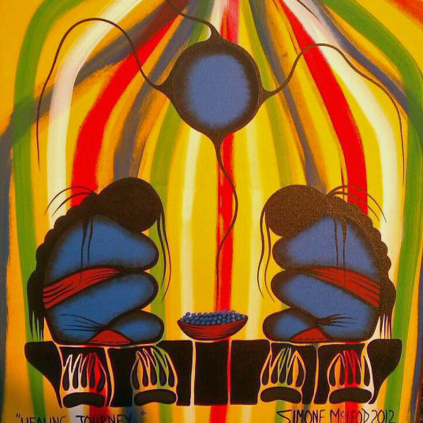 Above illustration: Firekeepers Igniting Our Spirits, acrylic on canvas by Simone McLeod (©2014 Simone McLeod). 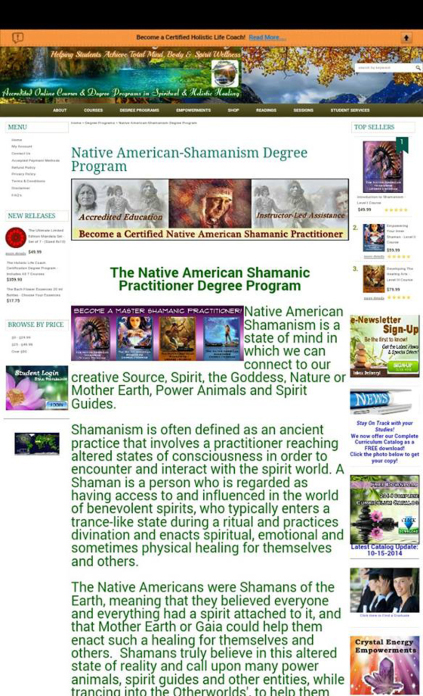 Below illustration: Print screen of a detail of the home page of the Divine Blessings Academy promoting their "Native American Shamanic Practitioner Degree Program" (October 21, 2014). Courtesy of Ogamawab Joseph Sutherland.